Rotork Fairchild has launched a new range of compact low pressure I/P (electro-pneumatic) transducers for instrument, analytical and scientific control applications. Precise pressure control, where output pressures must be accurately held at low pressures down to 70 mBar (1 psi), has traditionally been a difficult task for industrial instrumentation. 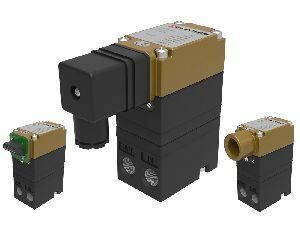 The new Rotork Fairchild T7500 range of transducers is specifically designed for these low pressure control systems with set point accuracy of 0.1%, even at pressures of less than 100 mBar. T7500 transducers accept supply pressures between 1.3 and 2 Bar (20 and 30 psi) with mA or VDC control signals to deliver critical high accuracy output ranges of 0-350 mBar (0-5 psi) and 0-1 Bar (0-15 psi). Flow configurations of 85 l/m or 200 l/m suit a wide range of application requirements. In addition, the T7500 can be ordered with DIN plug, NPT conduit or terminal block electrical connections styles to suit assembly requirements. Applications in test and medical equipment, leak detection equipment and other precise scientific areas are ideal for the T7500 transducers. The rugged cast aluminium construction and vibration resistant internal componentry is designed to withstand the rigors of both portable and stationary mounted equipment often found in medical and test situations. Find out more about Rotork Fairchild Transducers.